N Samiei, M Farahani. Isolated Left Ventricular Noncompaction with Normal Systolic Function in a Middle-age Woman. The Internet Journal of Cardiology. 2005 Volume 3 Number 1. Isolated left ventricular noncompaction (LVNC) is a rare congenital cardiomyopathy, which is characterized by excessively prominent trabecular meshwork and deep intratrabecular recesses. Common clinical presentations include: systolic and diastolic dysfunction, systemic embolism, ventricular arrhythmia(1). In this case we report a case of 42-year-old woman with history of embolic events and with the diagnosis of LVNC with preserved left ventricular systolic function. 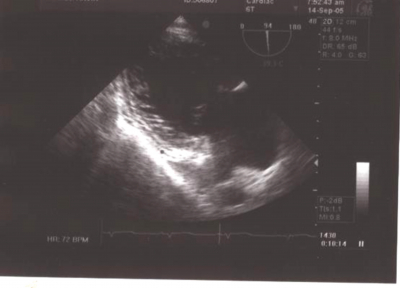 Echocardiography findings were consistent with criteria of LVNC.Our patient had history of embolic events that the last one occurred 2 weeks before this admission. Isolated ventricular noncompaction (LVNC) is a rare disorder of endomyocardial morphogenesis (2).It is characterized by prominent trabeculations with deep intratrabecular recesses and impaired ventricular systolic function in the absence of associated congenital heart disease (3).The disorder is believed to occur because of arrest of compaction of the loose interwoven mesh of myocardial fibers normally seen during development. Genetic mutations have been identified as a possible cause of LVNC (4).Most patients with LNC present with congestive heart failure and the diagnosis is made by echocardiography.4 clear cut echocardiographic criteria: 1) absence of coexisting cardiac abnormalities 2)a two layered structure of the left ventricular wall with the end systolic ratio of noncompacted to compacted layer >2 3) finding this structure in the apical and mid ventricular areas 4) blood flow directly from the ventricular cavity into deep intertrabecular recess (5). Magnetic resonance imaging (MRI) may also be helpful and in Alhabshan study MRI provided better delineation of the extent of the abnormal trabeculation in patients with noncompaction of the left ventricular myocardium. It was particularly useful when the myocardial involvement was subtle (6).There are few reports of isolated left ventricular noncompaction with preserved systolic function (7).Our patient presented with history of recurrent embolic events with no positive clinical finding in two previous echocardiography that was done for her. But the last echocardiography showed LVNC with preserved systolic function. LVNC is associated with a poor prognosis and most deaths are due to ventricular arrhythmia and heart failure, this patient was in middle age with preserved systolic function and no history of arrhythmia .Here are some questions that should be answered that whether preserved systolic function in LVNC can dislodge small thromboses that are made in deep recesses more than patients with depressed LV function and these patients are much more prone to embolic events than arrhythmia and heart failure. There are no specific modalities of treatment for LVNC, but systemic anticoagulation should be administered routinely for these patients. 2. Pignatelli RH,McMahan CJ,Dreyer WJ,Denfield SW,Price J,Belmont JW,et al.Clinical characterization of left ventricular noncompaction in children,A relatively common form of cardiomyopathy.Circulation 2003;108:2672-2678.